Fort Berens Receives Prestigious Lieutenant Governor’s Award for Excellence in BC Wines! Saturday marked a momentous day for Lillooet’s Fort Berens Estate Winery. 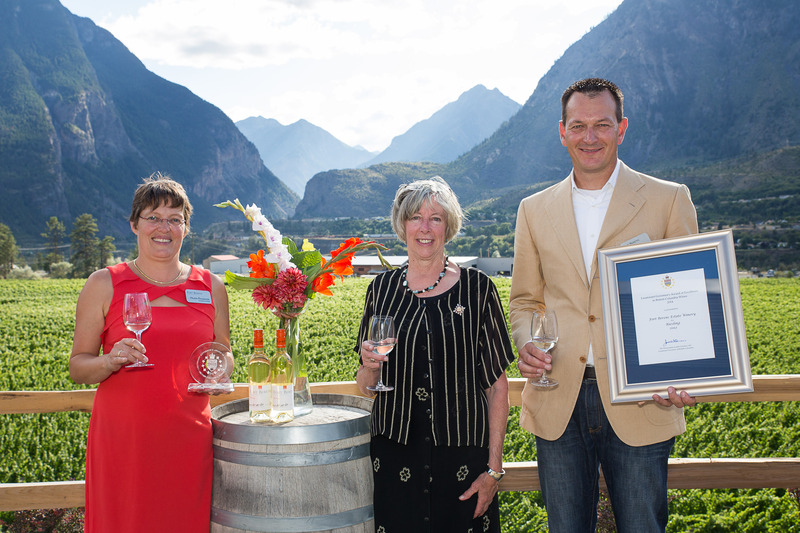 The dry, hot sun shone brightly in Lillooet as Lieutenant Governor Judith Guichon presented Fort Berens the prestigious 2014 Lieutenant Governor’s Award for Excellence in British Columbia Wines for their 2012 Estate Riesling. In addition to the Lieutenant Governor, there were close to 40 members of the Vancouver Consul Corps, local dignitaries including Mark Strahl, Member of Parliament for Chilliwack-Fraser Canyon, Jacquie Rasmussen, Electoral Area B Alternate Director, Squamish-Lillooet Regional District, Lillooet Mayor and Councillors Dennis Bontron, Marg Lampman and Wendy Parker, media, staff and local residents in attendance at the awards presentation. The awards ceremony took place outside on the deck of the gorgeous, new winery that opened up earlier this month. Talk about a special way to commemorate the opening! “We have come a long way, and today’s milestone is another important marker on our journey that still has many exciting times to come,” Heleen explained. At the end of the day, Rolf, Heleen and the team raised a glass to celebrate this milestone. It was a very special day where special memories were created for the Fort Berens team.